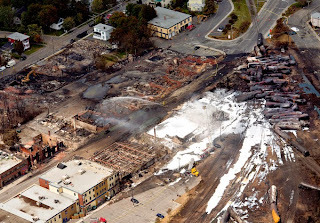 One year ago yesterday, a runaway train carrying crude oil derailed and exploded killing 47 people and destroying a large part of the little town of Lac-Mégantic. On the anniversary of the disaster, dignitaries joined the people of the town to mourn the tragic events of July 6 2013. After the fires burned out, the town was covered in black soot and 1.5 million gallons (6 million litres) of oil had seeped into the ground and the nearby river. The explosion destroyed the town's waste water treatment plant and released pathogens into the water. Far more serious are the enduring impacts on the air, water and earth. The damage wreaked by the explosion have produced scars that may never heal. In addition to the six million litres of crude that spewed from the train, a crater remains alongside other obvious signs of the cataclysmic event. Dozens of buildings remain off-limits cordoned off by metal fences as the decontamination work continues. Even more enduring are the emotional wounds that people will likely carry with them for the rest of their lives. A granite memorial in the shape of a book sits in front of the local church and bears the names of the victims. An 11 a.m. mass was preceded by a late night vigil and procession which included a moment of silence at 1:15 a.m. — the exact moment when the train crashed into the center of the town and exploded. People in the town have invoked symbols of rebirth to help them to cope. Hundreds of butterflies were released into the air and thousands of trout were released into the lake. People also planted flowers in a new garden near the train tracks. These gestures are meant to symbolize the purification of the air, water and earth which were contaminated by the wreck. Death and destruction are part of the costs of transporting fossil fuels by rail. People across the country and around the world are rallying in support of the residents of Lac-Mégantic who are still fighting to keep the oil trains out of their community. Vast numbers of people are mourning the loss of life and the environmental toll of the disaster. Many are vowing to do everything in their power to ensure that it does not happen again.